I met Eddie Knox of Springburn in the Cowgate in Kirkintilloch many years ago. Eddie had won the Junior International Cross Country Championship and was a multi title holder in every age group from Under 15 up. He had just come back from a race for a small Scottish team in Hannut in Belgium and couldn’t get over the fact that a Scotsman over the age of 40 had beaten him! 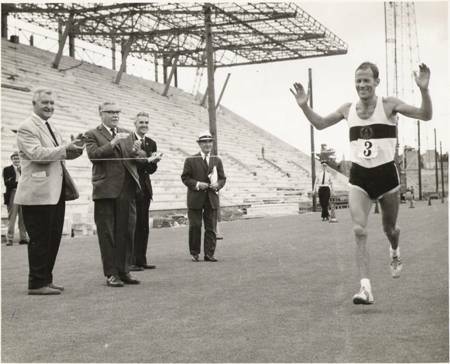 The veteran Scotsman was Bill Stoddart who came to most people’s attention when he won the 1969 SAAA Marathon Championship from the unfinished Meadowbank Track. The race was used as a trial for the route to be used for the Commonwealth Games marathon in 1970 and a good field was forward for the event including Donald Ritchie, Jim Wight, Hugh Mitchell, and various others. ‘A Hardy Breed’ covered the race as follows; “The runners covered one lap of the track and left to the cheers of a few workmen since spectators were banned from the site. Donald Ritchie also took part and shared the early lead with Bill Stoddart. The course was Restalrig Avenue, Joppa, Musselburgh, Seton Level Crossing, Longniddry and the Chance Inn Bridge where competitors turned for home. At three miles they were joined by Jim Wight (Edinburgh AC) who later became an international marathon runner. Police, motor cycles, patrol cars. ambulances and carloads of officials shadowed the runners through the city streets and out over the country course. However, by five miles Donald felt the side of his right foot burning and nipping but decided to press on. Jim lost contact on a hill at seven miles. Bill put in an effort before 10 miles and passed that mark six seconds clear in 54:10. Donald’s foot was now giving him great pain so he stopped at eleven miles to investigate. A three inch blister on the sole had burst. Even Donald could not restart and had to return to the stadium in an ambulance. He had modified a pair of EB racing shoes to reduce weight and increase breathability. That is, he had cut holes in them, succeeding only in decreasing stability allowing excessive foot motion and friction -and disaster. Bill Stoddart’s winning time was 2:27:25, second was Hugh Mitchell in 2:31:30 and third was Peter Duffy (Motherwell YMCA) in 2:37:04. Bill’s career as a marathon runner went from strength to strength and it will be covered soon but I’d like to tell for the first time that he was almost the subject of a protest and possible disqualification on the day. All the officials for the Commonwealth Games Marathon were having their first ‘dry run’ and were assigned to their places well in advance. I was part of the team at Fisher Row in Musselburgh who were to serve the drinks to the runners. When Bill passed a car stopped at the side of the road and gave him his drink – it had not been approved and sent out to us before the race started. The chief steward was all for reporting the incident and having ‘action taken.’ Fortunately we managed to change his mind. 1969 was a very good year for Bill. He had two marathon times in the Scottish Rankings: 2:27:25 at Meadowbank placed him tenth Scot and was the fourteenth time by a Scot that year; he also recorded 2:29:16 at Manchester on 20th July. The faster time placed him at number forty six in the UK; At ten miles his time of 50:55 placed him at number two in Scotland and thirteenth in the UK; he was also number three at Six Miles in Scotland. There was no way that anyone could regard his run in the marathon as a freak performance. Earlier in the year he had won the Scottish South West Cross Country title for the first time leading Wellpark to victory in the team race and in 1970 he competed for Scotland in the world championships. In looking at the rankings you must remember of course that it was at a time when British and Scottish endurance running was at a real peak with Don McGregor, Jim Alder, Alistair Wood, Fergus Murray, Ian McCafferty and Lachie Stewart were all running and in the wider British scene there were athletes like Ron Hill, Mike Freary, Bill Adcocks and Tim Johnston we all performing exceptionally well. His next medal in the Scottish championships was in 1971. Clyne and Youngson again: “Bill Stoddart remembers that “torrential rain greeted us as we prepared to warm up for the race and people could be seen dashing for cover. In a matter of minutes we were running round splashing like ducks in a pond!” In fact the weather was so bad that the officials were forced to abandon (temporarily) the SAAA Track and field championships while the road runners squelched onwards dourly. It was ever thus from a marathoners point of view – ‘track fairies.’ After six days of training totalling 58 miles, Pat Maclagan remembers starting the race through standing water in his Onitsuka Tiger shoes with added foam padding under the tongue, and heel pads. Since he did not wear socks he had also taped the soles of his feet. Unfortunately the soaking dislodged a piece of tape to his considerable discomfort. Pat recalls complaining about this to Don McGregor who replied callously or helpfully, “Why don’t you stop and take your shoe off, then?” Instead Pat spent some time trying to manoeuvre the offending tape between his toes so it became no longer a problem. Bill thinks that no one was keen to take the pace due to the depressing conditions so he led for most of 22 miles, By then Donald Ritchie had dropped back as had Don McGregor and Willie Day (Falkirk Victoria Harriers) had come through. According to Pat, Bill and Willie tried to get away at this point but he hauled them back. Bill remembers Pat “speeding past ” me as if I was going backwards and he didn’t even say ‘Hello'”. Or indeed ‘Goodbye’. Pat Maclagan won by two minutes in 2:21:17 with Bill Stoddart second in 2:23:31 and Willie Day third in 2:26:07 – good times considering the weather. This year he was eleventh in the Scottish rankings for the marathon, seventh in the one hour track run with 18,900m 11 ml 1309 yards, ninth in the ten miles track and twenty second in the 10000 metres with 31:12.6. The times and distances are remarkable and only indicate how high the standard was at the time – in 2010 he’d certainly be in the top two or three. The best summary of his career that I have come across is this article from the ‘Scotland’s Runner’ magazine in November 1992 outlining Bill’s career to that point. With a spritely and alert demeanour which belies his 61 years and semi retired status, Bill Stoddart appears every inch the world veteran champion. Watching him greet non athletic contemporaries at his regular training haunt – Battery Park in Greenock – the impression of a man with an unusual degree of zest and vitality for his years is even more pronounced. While Bill jogs along with easy grace, those he bumps into are either slowly walking their dogs or watching the activities of boats on the Firth of Clyde from the comfort of a park bench. his particular lunchtime however Bill was to join the ranks of the park bench pensioners. Taking an hour or so off from a fairly hectic daily training schedule, he managed to sit down long enough to talk about his latest athletic accomplishments and share the goals he has set himself for the coming year. Fresh from the recent world veterans road race championships where he struck gold in both the over 60’s 10K and25K, Stoddart is presently on the crest of a wave. Even by his own very exacting standards he has just achieved something rather special. “I really wanted to pull off the double”, he explains, “Although I’ve come first and second in these events in a single championships, I’ve never won both at once before.” Stoddart’s preparation for double gold was long and arduous. Despite his comparatively advanced years, he was putting in between 70 and 80 miles a week in the run up to Birmingham. On top of that he was racing every other week and doing the equivalent of another five miles a day deep water treading in a local swimming pool. “I’ve used deep water treading as part of my training for around three years now,” Stoddart confesses. “I started it in my late fifties and my times have got faster every year since. It’s a tremendous thing. It works your cardio-vascular system, tones muscles and prevents shock. People tend to use it when they’re injured but I’d recommend using it as an everyday training aid.” Bill’s performance in Birmingham rounded off a highly successful season for the Greenock man. At Arbroath in June he achieved a world best in his age group for the half marathon with 75:53, while in August he did, to all intents and purposes, the same thing in the 10K when he clocked 34:51. This however has still to be ratified. With the world ten mile best in the same age group already lodged under his belt (at East Kilbride and Lanarkshire 10 mile road race in August 1991 he clocked a formidable 57:43) Stoddart’s remaining target is an Over 60 world best in the marathon. This he hopes to have acquired by the end of the year. “I clocked 2:49:53 at the Inverclyde Marathon last year,” he says “I’ve got 2:42 to beat but I’m fitter this year than I was in 1991 so I think I’m capable of the low forties.” Whether or not Bill does achieve his marathon goal by the end of the year, he won’t be short of accomplishments to list on his athletics curriculum vitae. Stoddart has won Scottish and British titles in all veteran’s age groups, Scottish titles in distances from 1500 metres up to the marathon and the British in distances of 10000 metres and upwards. Meanwhile on top of this Stoddart has the distinction of being the only man to have held world bests in all veteran age groups, these being in distances of 5K and upwards. It all adds up to a remarkable career. What makes it all the more outstanding however is that it hasn’t been developed on the back of an equally glittering senior career. Although he competed as a senior, representing Scotland a number of times along the way, it is only since turning 40 that he has become what is euphemistically known as a world beater. Stoddart puts his ‘late development’ down to the fact that he was too much of an all-rounder in his early days to concentrate solely on one sport. A county standard table tennis player and a keen junior football player, he only began running ‘for fun’ when he was called up for National Service in 1952. “I was stationed with the RAF in the Black Forest for two years,” he recalls, “the choice was either to become an alcoholic or a sportsman. I decided I’d rather become a sportsman. I started doing cross country running every Wednesday and eventually became good enough to win a place in the RAF combined team. I suppose I got a taste for running at this time but it was very much a leisure pursuit. I still saw football and table tennis as my main sports.” By the time Bill returned to civilian life he was 23. His appetite for running whetted, he joined Greenock Wellpark Harriers to which he has remained loyal ever since. As it turned out he was right. Brown gave Stoddart a training schedule. Bill who had just entered further education for the first time and had more time on his hands than he was used to, duly complied by following it assiduously. Table tennis and football were finally dropped and before long he was representing the SAAA in road races and had made the Scottish cross country team, a feat he managed in four successive years from 1969 to 1972. “I was known as the old man of the team,” says Stoddart, a veteran of 42 during his last year in the team. In making the national team at this late juncture in his life. the Wellpark Harrier had what he describes as the ‘great honour’ of being part of one of the greatest ever Scottish cross country teams and attending the World Championships in Vichy. Among those he travelled to France with were Lachie Stewart, Ian McCafferty, Ian Stewart, Gareth Bryan-Jones and Jim Alder. It was a team capable of a top three place. In the end however it failed to place among the medals. “We got caught up in the strikes that were hitting Paris at the time. We ended up travelling overnight and were tired before we even started running. There’s no doubt we could have done better if we had been blessed with better circumstances,” he now says. Although he thinks he might well have achieved more as a senior had he taken running more seriously at an earlier age, Stoddart doesn’t regret the way he’s done things. “I suppose I thought I had the balance right at the time,” he says. “There were too many other things to do when I was a young man. Nowadays it is a lot easier to be concentrated on the one thing.” Certainly he has packed a lot into his life and has a number of other strings to his bow which might be absent were it not for the fact that he had an all-rounder’s outlook when he was young. Head of Management and Industrial Studies at James Watt College, Stoddart was one of the first people to complete an Open University degree and can also boast an MA from Strathclyde University in Industrial Relations. On top of this he is a corporate member of the Institute of Industrial Managers, the Institute of Mechanical Engineers and the British Board of Management. Other sports related commitments include the post of chairman of the Inverclyde Athletics Initiative and a place on the committee of the Scottish Veteran Harriers Club. In many ways Bill exudes the qualities associated with old fashioned athletics values. It is only since a more flexible working life and semi retirement came his way that he has made running a major priority in his life. “I’ve always worked full time,” says Bill. “I’ve never made a penny out of my running.” Although he admits he “wouldn’t say no” to making a small amount from his efforts, Stoddart says he would never go out of his way to look for cash. The fact that a fair number of the people he beat in Birmingham have subvention funds and are managing to make a living from running as a vet is not enough to change his strongly held beliefs on this matter. “It’s gone a bit too far,” he says. “Take Linford Christie and Carl Lewis. They’re delaying a race until the stakes are high enough. It’s all gamesmanship and professionalism. People are obsessed with it. I remember when people used to be happy to run for a canteen of cutlery or a set of sheets.” Whatever his views on the sport’s ethics (or lack of them) Stoddart is nonetheless determined to stay with it for as long as he can. “Till death us do part!” He jokes. Who knows then what the future could hold for veteran athletics? I like to think I’ve set standards for others to beat,” says Bill. “And I hope to go on doing so.” Now in his sixties, he’s one of the few vets in any age category to have dipped below 76 minutes for the half marathon, 35 minutes for the 10K and 60 minutes for 10 miles. He’s also getting faster as he gets older. There would seem to be little doubt that Bill Stoddart could be setting challenging standards for some time to come. Where do these times stand in 2010? At British level, the half marathon time above still stands as at December 2009 as a British M60 age best but Bill ran an excelleny 18:18 for 5K Road on 18th June 1997 at Lochinch which was and still is a British record for the M65 age group. It is a sign of the quality of the times that in an era when veterans and masters athletics are being fought out at a higher level than ever before that times set eighteen and thirteen years ago are still top of the lists. Thanks for letting me know abut Bill Stoddart. I’ve now read his “Scotsman” obituary online. Although I ran in races with him only in 1968 and 1969, he made quite an impression – not least because he was a good number of years older than us yet did not seem to have any serious running background! Also, he always seem to run really hard – and hope for the best! If my memory is correct, in his early road races, he tended to fade after battling with the leaders but gradually stayed with them longer until, of course, he won the Scottish Marathon of 1969 from the under-construction Meadowbank Stadium. I ran in the Shotts and Dunblane Highland Games 14 mile races on successive Saturdays in Sept. 1968 and while Bill was 6.30 mins behind Lachie Stewart in 6th pos. he had reduced that to just over 5 mins behind Lachie at Dunblane also in 6th! I ran in what would have been his first marathon – Shettleston, 1969. It didn’t go exactly to plan and he should have won it convincingly. He was about a minute ahead of me at 20 miles and I was well ahead of the rest including Sandy Keith who won in 2:29:22. Sadly a marshall wasn’t in place to direct Bill and me to turn on to a minor road which eventually rejoined the full loop we covered on the first lap. I don’t know what Bill’s reaction was when he realised like me that we had run in error the full loop a second time to add more than half mile to the marathon distance! Personally, I felt very deflated as I probably would have held on to 2nd spot and got a pb. So the account of that Shettleston in the Scottish Distance Running History web-site doesn’t really reflect Bill’s potential success! Of course, Bill achieved proper recognition at the Scottish Marathon 6 weeks later when he made light of the torrid conditions on a humid day exacerbated by the fumes from the continuous traffic on the A1. Although lying 2nd at the turn, I succumbed a few miles from the finish from asthma symptoms related to hay fever. Bill though from the photo of him finishing looked very sprightly with a well deserved victory.